Obama is openly siding with Marxists Raul Castro, Hugo Chavez and Daniel Ortega in punishing the government of Honduras. The official said that $215 million in grant funding from the U.S. Millennium Challenge Corporation to Honduras would also have to end should Clinton make the determination that a military coup took place. About $76 million of that money has already been disbursed and a second U.S. official said this implied that the remaining roughly $139 million could not be given to Honduras should the determination be made. Diplomats said that the United States had held off making the formal determination to give diplomacy a chance to yield a negotiated compromise that might allow for Zelaya's return to power. Such efforts, however, appear to have failed for now and so the United States is taking steps -- including its decision on Tuesday to cease issuing some visas at its embassy in Tegucigalpa -- to raise pressure on the de facto government. So our foreign policy is now in lock-step with Hugo Chavez. This whole thing is sickening. Hondurans are showing the world what it means to be a free nation. These people who will stand up and fight for their freedom are my kind of people. 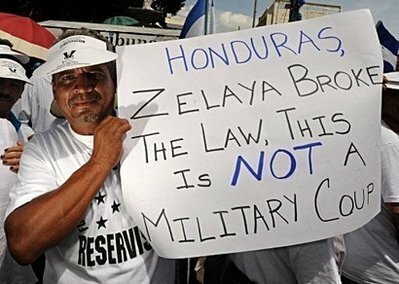 We are seeing Honduras take their constitution seriously and we here in the United State do not. I don't mean those of us at this blog and the many Townhall and Tea party etc. people but Obama, his administration, our lefties in government and those that voted of the slime fascist in power and many rino's do not. Barack HUSSEIN Obama sent $900 million to Hamas-ruled Gaza almost immediately after taking office...now he wants to cut off aid to a nation that just legally booted a fascist president. People against ousted Honduras President Manuel Zelaya gather outside of the presidential residence in support of the interim government in Tegucigalpa, Friday July 3, 2009. 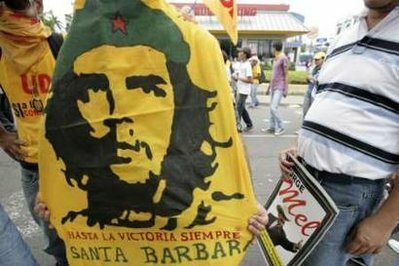 A supporter of Honduras' ousted President Manuel Zelaya wears a flag with an image of guerrilla leader Ernesto "Che" Guevara during a march in Tegucigalpa July 3, 2009. Honduras rebuffed demands by the international community to reinstate President Manuel Zelaya and pulled out of the Organization of American States, thrusting the poor Central American nation deeper into political crisis and isolation. Zelaya was traveling in Central America but planned to return to Honduras on Sunday, according to Nicaraguan President Daniel Ortega. Honduras' interim government has said it will arrest Zelaya if he returns, setting up a potentially volatile showdown. About 10,000 supporters of the president ousted in a military coup June 28 again marched in his support Saturday, blocking traffic close to the presidential palace, which is occupied by a caretaker president selected by Congress to replace Zelaya, but also heavily fortified and guarded by soldiers. 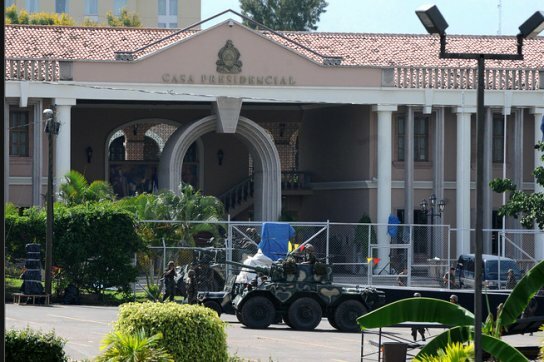 Diplomats from across the Americas had hinted they would suspend Honduras' OAS membership during an emergency Saturday meeting of the organization in Washington. But after rejecting the personal appeal of the group's secretary-general, Jose Miguel Insulza, the Honduran government decided to renounce its charter rather than wait to be punished. In a letter to Insulza read on state television Friday night, interim Honduran President Roberto Micheletti wrote that "the OAS is a political organization, not a court, and it can't judge us." "The government rejects the attempts of the OAS to impose unilateral resolutions," said the letter read by deputy foreign minister Martha Lorena Alvarado. Micheletti said leaving the OAS means his country will not face economic sanctions that were expected if the group's membership had been suspended. The OAS still can encourage other organizations around the hemisphere to halt aid and loans to one of Latin America's poorest countries. Also late Friday, a grenade exploded outside Immigration offices in Tegucigalpa, the capital, smashing windows and damaging the building's facade — the fifth such explosive attack since the coup, according to police. The letter renouncing Honduras' OAS charter capped a long and frustrating Friday for Insulza, who flew to this country to demand that the interim government restore Zelaya, who was rousted from his bed by soldiers, handcuffed and flown into forced exile. The world community has demanded his return to office. "We wanted to ask that this situation be reversed," Insulza told a news conference after meeting with Supreme Court President Jorge Rivas, the attorney general and other political leaders. "Unfortunately, one must say that there appears to be no willingness to do this." Insulza said Honduran officials gave him documents showing that charges are pending or have been brought against Zelaya, which they say justified the coup. The military ouster came after Zelaya pushed for a referendum on constitutional reform that the Supreme Court, the attorney general and Congress had all said was illegal. The Supreme Court, which authorized the coup, also said it would not agree to restore the toppled leftist leader despite Insulza's personal appeals. "Insulza asked Honduras to reinstate Zelaya, but the president of the court categorically answered that there is an arrest warrant for him," court spokesman Danilo Izaguirre said. During the trip, the Americas' top international diplomat also met with the two main candidates in Honduras' Nov. 29 elections and with the leftist Popular Block, an umbrella group of farm, labor and student groups that largely supports Zelaya. But he did not see Roberto Micheletti in order to avoid legitimizing the government. 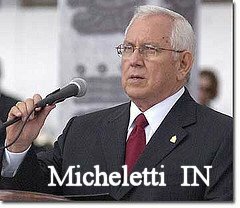 Micheletti has vowed to serve out the six months remaining in Zelaya's term. Foreign Minister Enrique Ortez, said that Insulza "cannot return to Honduras, and if he does he will be arrested and tried." Ortez also claimed that members of the Zelaya administration stole at least $40 million in cash from the Central Bank during their last day in power and announced the new government was firing at least 10 ambassadors, including those to the OAS, the United Nations, Mexico and Panama. 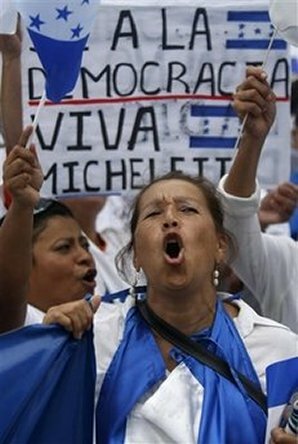 Micheletti's supporters say the army was justified in ousting Zelaya because he was trying to use his referendum to extend his rule. Zelaya denies that and has said he will no longer press for constitutional changes. Nations around the world have promised to shun Micheletti and Honduras already is suffering economic reprisals. Neighboring countries have imposed trade blockades, major lenders have cut aid, the Obama administration has halted joint military operations and all European Union ambassadors have abandoned the country. The U.S. Embassy in Honduras issued a statement expressing "deep concern over restrictions imposed on certain fundamental rights" by Micheletti's government, including a curfew in force since the coup, and "reports of intimidation and censorship against certain individuals and media outlets." Hours later, acting President Roberto Micheletti and vice chancellor Martha Lorena de Casco announced Honduras planned to withdraw from the region’s key diplomatic organization. The move preempts an OAS General Assembly meeting scheduled for Saturday, where Honduras was widely expected to be suspended from the group for overthrowing a democratically elected leader. She ended her brief statement by invoking article 143 of the OAS charter — without elaborating what that article says. The OAS clause she cited calls for member nation to withdraw from the OAS after submitting a written complaint. This is good news, it is a good start for even a small Nation such as Honduras to begin the task of telling the Leftist infested organizations of the World to screw off. It’s time for other countries to step forward and flip off these “organizations” who have nothing better to do than to meddle in the affairs of sovereign nations. I miss the days of Oliver North and Ronald Reagan. the Honduran government decided to renounce its charter rather than wait to be punished. I like that attitude: "You can't fire me, I quit..." LOL! Good for Honduras! Just to note, Venezuela is an honored member of the Organization Of American states. And Cuba has recently been made a member of good standing in the OAS. Straight from the mind of Barack Hussein Obama. The Obama administration said Wednesday it has suspended joint military operations with Honduras to protest a coup that forced President Manuel Zelaya into exile. The U.S. withheld stronger action in hopes of negotiating a peaceful return of the country's elected leader. The Organization of American States, meeting in Washington, gave Honduran coup leaders three days to restore Zelaya to power - under threat of suspending Honduras's OAS membership. Afterward, several officials said the administration is still reviewing the possibility of cutting off U.S. aid. Robert Gibbs, the White House press secretary, said, "We continue to monitor the situation and will respond accordingly as events transpire." At the State Department, spokesman Ian C. Kelly said the department's top diplomat for the Americas, Thomas Shannon, met with Zelaya at OAS headquarters on Tuesday evening. Kelly would not reveal details, except to say Zelaya thanked the administration for supporting his unconditional return to power. Kelly said he was not aware of any plan to recall the U.S. ambassador from the Honduran capital. Another official, speaking on condition of anonymity in order to discuss internal deliberations, said the administration believes it stands a better chance of achieving a peaceful outcome if it keeps a diplomat in Tegucigalpa. The official also said the U.S. was not advocating that the matter be taken up by the U.N. Security Council. Kelly said the administration was still studying whether the forced removal of Zelaya was a military coup in a legal sense that would trigger a cutoff or suspension of American financial assistance. "Our legal advisers are actively assessing the facts and the law in question, which we take very seriously," Kelly said. The administration appeared to be counting on the threat of Honduras having its OAS membership suspended as leverage in getting Zelaya back in power. While the administration joined the OAS in calling for Zelaya's unconditional return, with no limits on his presidential powers, it also seemed open to some form of compromise. U.S. officials said they were pleased that Zelaya, who had vowed to return to Honduras on Thursday, put that off after the OAS announced the three-day deadline for the country's interim leaders to accept him back. 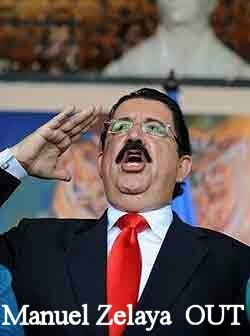 Zelaya was in Panama on Wednesday to attend that country's presidential inauguration. Zelaya said he would put off his return until the weekend. 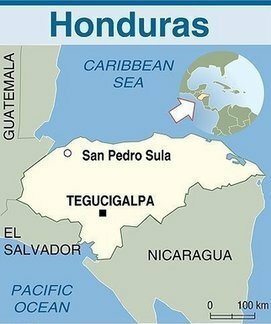 The decision to suspend U.S. military activities in Honduras was announced by Pentagon spokesman Bryan Whitman, who said, "We've postponed any activities in Honduras right now as we assess that situation." Whitman would not be specific, but the suspension could have broad implications because the United States runs a large Central American security and counternarcotics operation from a jointly run air base in Honduras. Whitman said only operations affecting Honduras itself are on hold. Earlier, OAS Secretary-General Jose Miguel Insulza delivered what he called "an ultimatum" for Zelaya's safe return. In a sharply worded resolution, the OAS said it vehemently condemned the coup and "the arbitrary detention and expulsion" of Zelaya. The coup, the OAS resolution said, has produced an "unconstitutional alteration of the democratic order." Calling Zelaya's overthrow an "old-fashioned coup," Insulza said: "We need to show clearly that military coups will not be accepted. We thought we were in an era when military coups were no longer possible in this hemisphere." Zelaya has said he intends to return home accompanied by Insulza, the presidents of Argentina and Ecuador and the head of the U.N. General Assembly to seek restoration of his authority. Roberto Micheletti, named by Honduras' Congress as the new president, said Tuesday that Zelaya could be met with an arrest warrant if he returned. Honduras has risen above the typical third world type of politics only to have the USA spit in their face for it. 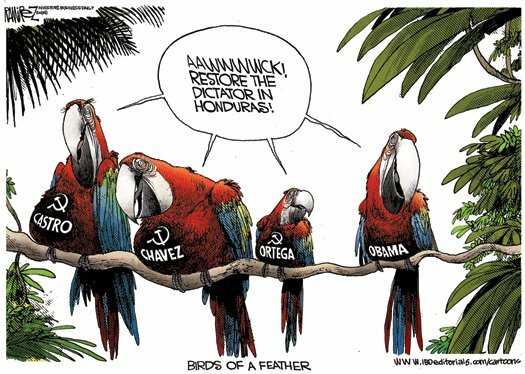 Charles Krauthammer talks about Honduras and how wrong Obama is about it. "Two weeks ago he refuses to meddle in a country where peaceful demonstrators are getting shot be a theocratic dictatorship. He doesn't want to choose sides. And, now he's eager to meddle on behalf of a president in Honduras who's a Chavez wannabe who's strong-arming his way to a referendum that has been declared illegal by his Supreme Court as a way to have a referendum to establish a assembly that will establish a new constitution that will be a Chavez-like dictatorship... Look a rule of thumb here is whenever you find yourself on the side of Hugo Chavez, Daniel Ortega and the Castro twins you ought to re-examine your assumptions." 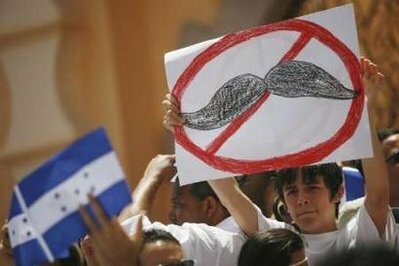 A man holds a banner against ousted president Manuel Zelaya during a rally at Morazan Square in central Tegucigalpa. Officials Tuesday ordered the arrest of ousted President Zelaya if he returns to Honduras after being expelled in an army-backed coup, as thousands of protesters took to the streets here. The U.S. co-sponsored a successful U.N. resolution supporting Honduras's ousted leader Tuesday as Republicans began to speak out against the Obama administration's condemnation of the overthrow. Manuel Zelaya, who was arrested and forced into exile Sunday, addressed the U.N. General Assembly after the unanimous vote on the resolution sponsored in part by Bolivia, Mexico, Venezuela and the United States. "The resolution that the United Nations has just adopted unanimously ... expresses the indignation of the people of Honduras and the people worldwide," said Zelaya, who began his speech by thanking Venezuela and Ecuador. President Obama, meeting with Colombian President Alvaro Uribe on Monday, said the U.S. would "stand with democracy" in the face of the overthrow. "We believe that the coup was not legal and that President Zelaya remains the democratically elected president there," Obama said. "It would be a terrible precedent if we start moving backward into the era in which we are seeing military coups as a means of political transition rather than democratic elections." Secretary of State Hillary Rodham Clinton said Sunday that the ouster "should be condemned by all." When contacted for comment by The Hill on Tuesday, the office of Senate Foreign Relations Committee Chairman John Kerry (D-Mass.) said the senator was reserving comment until the situation in Honduras becomes clearer. Zelaya planned to return to Honduras on Thursday accompanied by the head of the Organization of the American States, which was to meet in Washington after the U.N. session to formulate a response. "I believe, if he — if he does come either today or tomorrow, that he will likely meet with officials from the State Department, some of whom, as I said, have been in contact," White House press secretary Robert Gibbs said in Tuesday's briefing, repeating this when pressed by a reporter about whether Zelaya would meet with Obama. Venezuelan President Hugo Chavez has urged Zelaya to try to speak with Obama while in D.C., saying the American president's support would "deliver a major blow" to Honduras's interim government. But that support for Zelaya, who was arrested and forced into exile on Sunday after pressing ahead with a constitutional referendum that would have allowed for his reelection, is gradually drawing more criticism of the White House. "Manuel Zelaya trampled the Honduran Constitution by pushing for his illegal referendum to allow him to rule indefinitely, and by firing the top military official, General Romeo Vasquez Velasquez, when he refused to comply with Zelaya's unconstitutional orders," Rep. Connie Mack (R-Fla.) said in a statement to The Hill on Tuesday. "There is little doubt that Zelaya, in his blatant power grab, has moved Honduras down a dangerous path toward less freedom, less security, and less prosperity. He consistently ignored the checks and balances which are essential to a democratic government." 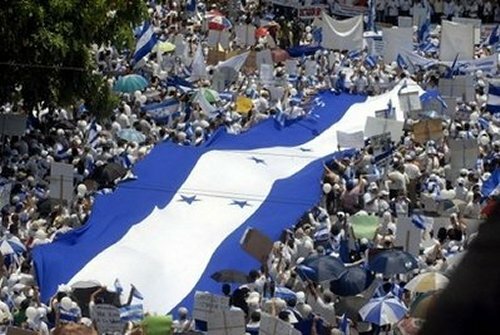 The referendum had been judged illegal by Honduras's highest court and was opposed widely through political and military circles, including within Zelaya's own party. Charles Krauthammer was dead on. Stinging rebuke of Obama in a Krauthammer way. 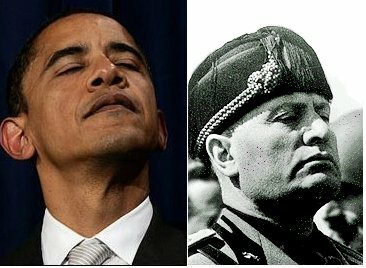 There is no explanation for Obama not supporting their defense of the constitution except that Obama is a Communist. Also Obama doesn't want the actions by the Honduran Legislature/Courts/Military to be seen as setting a legally and morally justifiable precedent for other Western Hemisphere nations. Obama sees no need to defend a Constitution. He is busily trying to get rid of our own. If he can get us under the UN for climate change and under International Court, global interests will usurp our Constitution. Getting rid of our Constitution is most of his hope and change. He hopes he can get rid of it and change the US into a Communist Dictatorship. Barack Obama said on Monday the coup that ousted Honduran President Manuel Zelaya was illegal and would set a "terrible precedent" of transition by military force unless it was reversed. "We believe that the coup was not legal and that President Zelaya remains the president of Honduras, the democratically elected president there," Obama told reporters after an Oval Office meeting with Colombian President Alvaro Uribe. Zelaya, in office since 2006, was overthrown in a dawn coup on Sunday after he angered the judiciary, Congress and the army by seeking constitutional changes that would allow presidents to seek re-election beyond a four-year term. The European Union and a string of foreign governments have voiced support for Zelaya, who was snatched by troops from his residence and whisked away by plane to Costa Rica in his pajamas. Obama said he would work with the Organization of American States and other international institutions to restore Zelaya to power and "see if we can resolve this in a peaceful way." Obama is a LIAR and he disgusts me with his many lies. There was illegal, fraudulent activity that involved the shipment of ballots from Venezuela. There was a court ruling with regard to the above. There was an an arrest and exile to another country for the perpetrator's own safety. There was a formal impeachment by Parliament. Roberto Micheletti is the interim President of Honduras, according to Honduran law and due process. The Honduran Supreme Court of Justice has confirmed that Honduran president Manuel Zelaya was detained this morning by the military in compliance with an order of the courts of law. The Obama administration worked in recent days to prevent President Manuel Zelaya's ouster, said a senior U.S. official. The State Department, in particular, communicated to Honduran officials on the ground that President Barack Obama wouldn't support any nondemocratic transfer of power in the Central American country. "We had some indication that a move against Mr. Zelaya was afoot," said a U.S. official briefed on the diplomacy. "We made it clear it was something we didn't support." "We call on all parties in Honduras to respect the constitutional order and the rule of law, to reaffirm their democratic vocation, and to commit themselves to resolve political disputes peacefully and through dialogue," Clinton said in a statement. Venezuela’s President Hugo Chavez on Sunday put his troops on alert over a coup in Honduras and said he would respond militarily if his envoy to the Central American country was attacked or kidnapped. Giving voice to the deep fears that sparked the military’s action, retired Honduran general Daniel Lopez Carballo justified the move against the president, telling CNN en Espanol that Mr. Zelaya was a stooge for Mr. Chavez. He said if the military had not acted, Mr. Chavez would eventually be running Honduras by proxy. Nicaraguan paper La Prensa Gráfica reports that the Venezuelan ambassador to the Organization of American States claims that the ambassadors for Venezuela, Cuba and Nicaragua in Honduras were kidnapped, hooded, and beaten. OAS Secretary General José Miguel Insulza announced he will travel to Honduras. An official statement of the Supreme Court of Justice explained that the Armed Forces acted under lawful grounds when detaining the President of the Republic, and by decommissioning the materials to be used on the illegal poll which aimed to bring forth Executive Power against a judicial order. Honduran president Manuel Zelaya was detained this morning by the military in compliance with an order of the courts of law. Congress swiftly appointed its speaker Roberto Micheletti - a member of Mr Zelaya's Liberal Party, but an opponent of him - as acting head of state. The Honduran Congress named its leader, Roberto Micheletti, to replace Zelaya following his military ouster and forced exile in Costa Rica. A resolution read on the floor of Congress accuses Mr. Zelaya of "manifest irregular conduct" and "putting in present danger the state of law," a reference to his refusal to obey a Supreme Court ruling against holding a constitutional referendum. ...Congress voted Sunday to remove Mr. Zelaya, and appointed Mr. Micheletti as the new chief executive, as is mandated by the constitution....In Honduras, television stations were off the air, and electricity was out in parts of the capital.. Reaction to the apparent coup was swift. U.S. President Barack Obama said he was "deeply concerned" and called on all political actors in Honduras to "respect democratic norms, the rule of law and the tenets of the Inter-American Democratic Charter. Any existing tensions and disputes must be resolved peacefully through dialogue free from any outside interference," he said. Good for them for doing this. 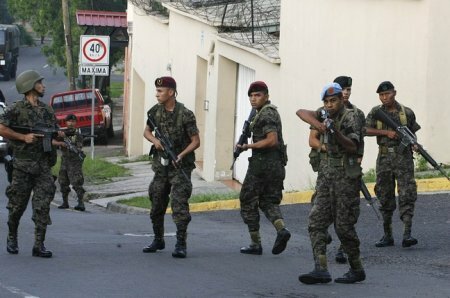 This was the Honduran Armed Forces working with the blessing of the Courts taking action against a tyrant. Zelfaya the president of Honduras was trying to stage an “auto-golpe,” meaning a self-coup where an elected leader takes over all powers and gets himself permanently in power. He had been told by the Courts and parliament that he couldn’t do it, but he was going to go ahead with the faux “referendum” anyway, so the authorities had every right to get rid of him. Zelfaya is a stooge for Chavez. Obama and Hillary are completely and openly on Chavez side. 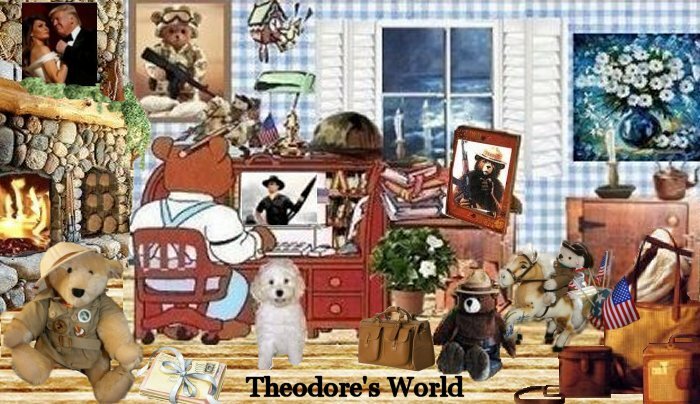 A special hat tip and thank you to Fausta and also for her translations to English of the news articles on this.